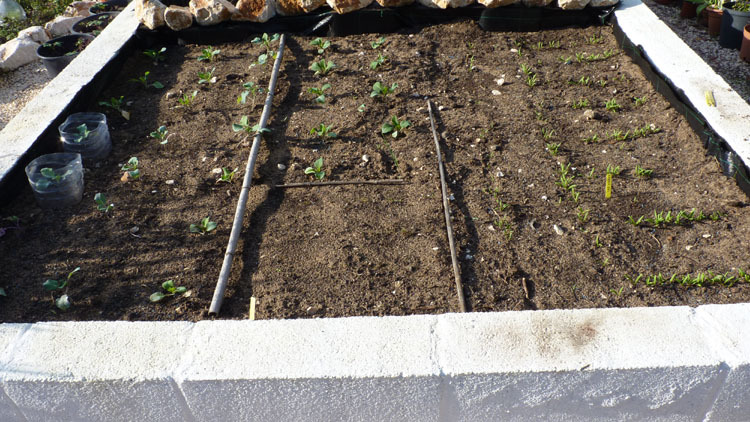 Over the next year I will be keeping a monthly diary of all the fruit and vegetables I grow in my urban garden here in the Algarve. Gardening is one of my passions, and although my efforts are not always successful my tenacity makes up for what I lack in knowledge. I’m always open to suggestions (or encouragement) so please feel free to leave a note in the comments section below. December was the first entry in my diary. When I look back at December’s entry and study the pictures – Wow what a difference. My vegetable seedlings have grown beyond my wildest expectations! 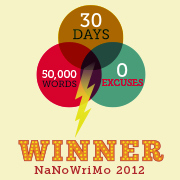 Yes, I know, I’m easily pleased. 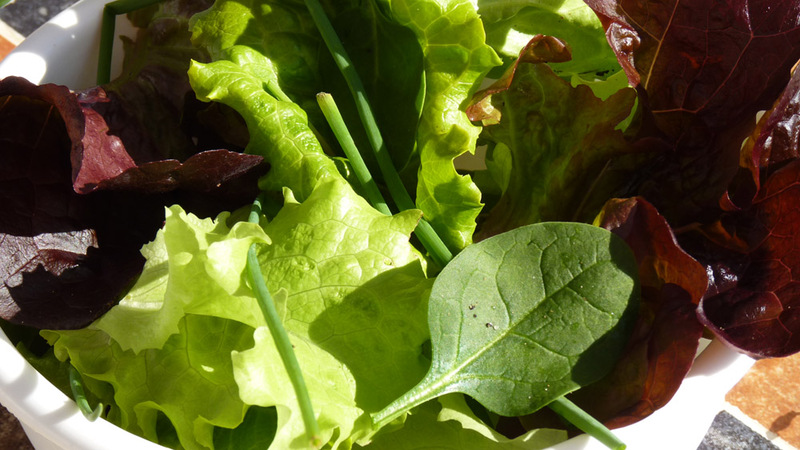 This is my first bowl of winter home-grown salad: Rosso and green lettuce, baby spinach leaves and chives from my herb garden. Herb “garden” is a very loose description as I no longer try to grow herbs in “twee” little rows. I allow them to self-seed and grow where they are most happy. Due to lack of space in my urban garden I grow several fruit and vegetables in containers. Some more successfully than others! The radish sown in November are unfortunately struggling due to lack of sunlight. While the pot is in full sun during the summer months, the sun is lower in the winter so the pot remains in shade for most of the day. Mental note: do not use this pot in winter! Use for Zucchini or cucumber in summer. Discard radish and use pot for to recycle “green” waste during the winter months. 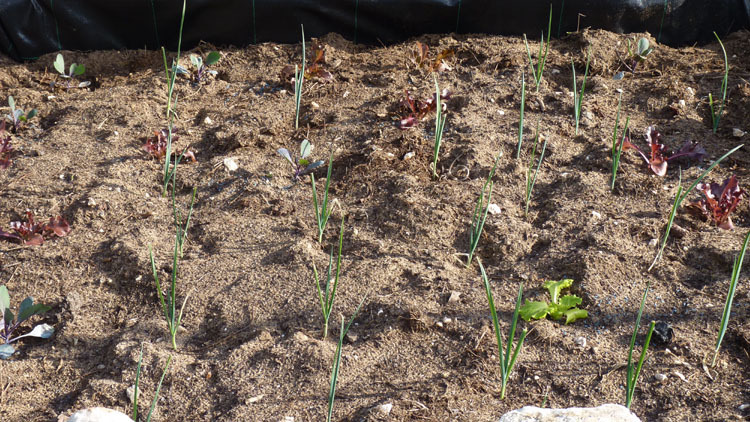 I scattered radish seeds between a row of leeks in my raised vegetable plot on the 1st of January. There is no sign of growth as yet. 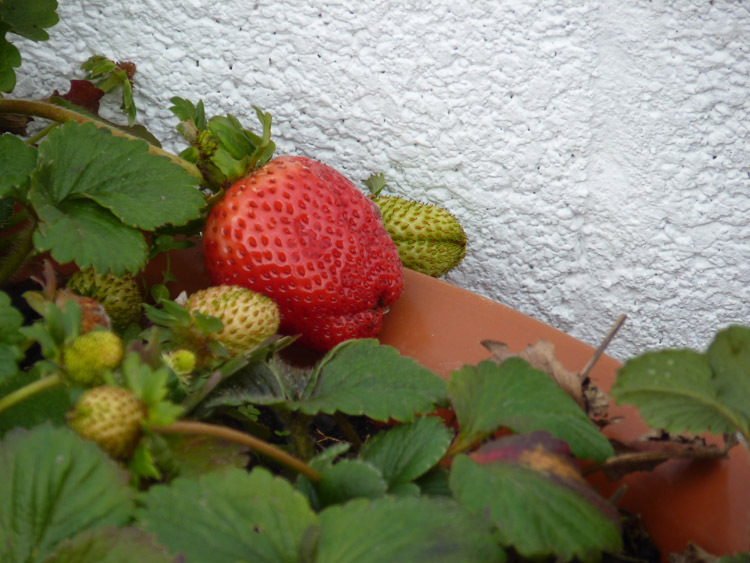 Some of my strawberry plants continue to give monster strawberries. They are absolutely delicious! Baby strawberry plants planted late November are now in flower. 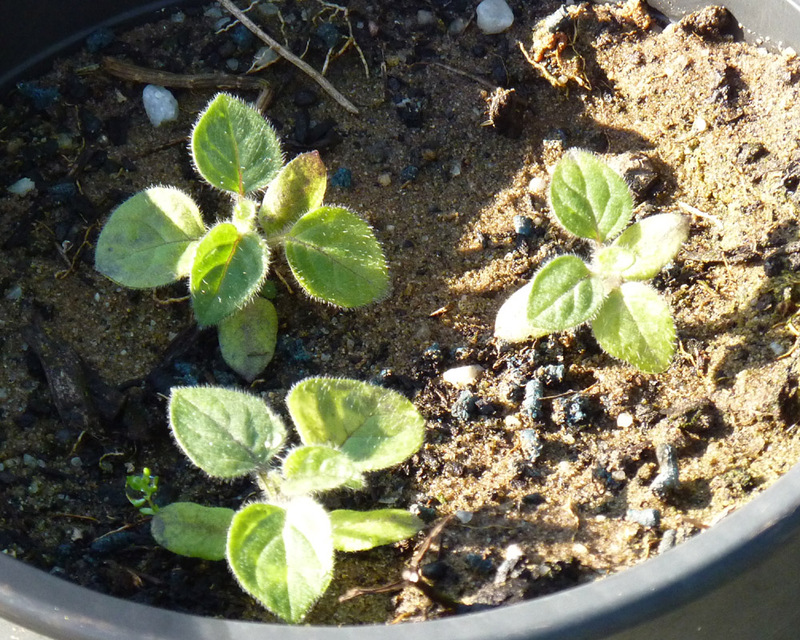 I planted seeds from Physilis fruit in late October. The seedlings are still alive. Chili: The mature chili plants continue to bear fruit, but the seedlings are less than enthusiastic and are fighting for life. Lettuce We ate our first “feast” of organic home-grown lettuce last week. Rhubarb This appears to be dormant. Friends tell me repeatedly “You can’t grow Rhubarb in Portugal” I disagree (I’m an optimist) and firmly believe “Where there is a will there is a way!” I may have to admit I’m wrong, but at least I tried! Hey I’m a Capricorn and Capricorns are stubborn right? Today! Look how much they’ve grown in only a few weeks! I talk to my vegetables every day! 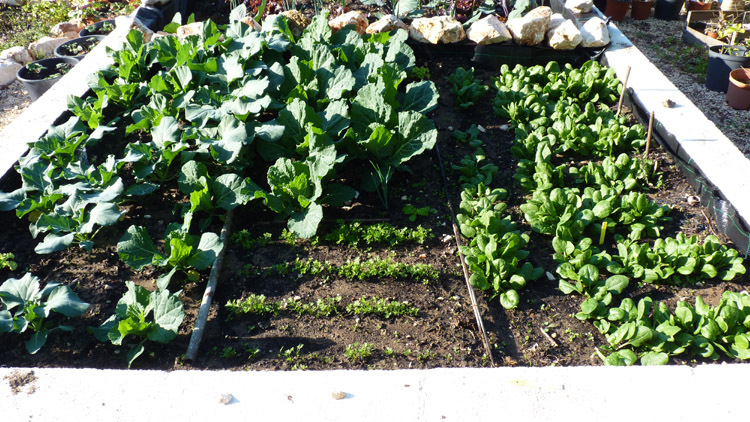 I’ve never grown vegetables during the winter months in Portugal before so I am astounded by the results. Daily temperatures have been as high as 22C and night temperatures falling to about 4C. Plants for free! It amazes me that I can spend weeks trying to grow seedlings in seedtrays or pots with limited success. Why bother? 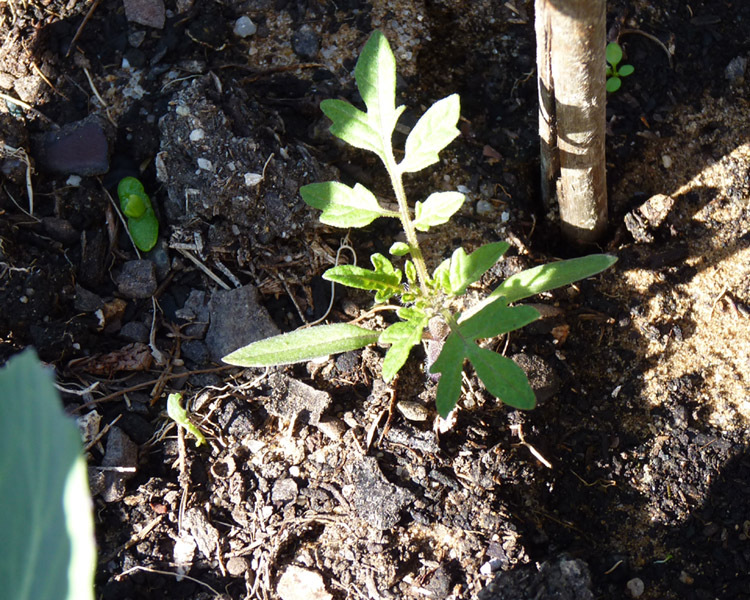 I found several self-seeded tomato plants growing between the spinach and rosso and red cabbage, plus rosso seedlings growing in the gravel and it’s only January! The Portugal News (A weekly free newspaper in English) now have a bi-weekly gardening section which relates to Portugal! Yay! Wow, talking to the plants might be doing the trick! My lettuces seem to be so tough. Yep you must talk to your plants. Are the lettuce getting enough water? Awww Lindsay, I would be lost without a garden. I can just imagine you sending off your man to get some earth 🙂 especially after the TV episode. Wow. You make me want to run out and start digging in the dirt. Alas, I am in a rental until i can get home to my magnificent gardens. Strawberries so quickly! Why do we have to wait a season for the plants to mature in this neck of the world? Bummer. Portugal looks beautiful. Do you have any type of winter? We are having an exceptionally good winter. Lots of sun. I am surprised at the strawberries, and indeed all my winter veg. However, we don’t get frost where we are so perhaps thats the answer. It will be interesting to compare pictures in January next year. I have found leeks very easy to grow, but then we get a lot of rain here which helps them grow plump and delicious…you might want to give them a little extra water! Hi Hortophile thanks for the tips! Do you use tubes to cover the leeks as the grow to blanch them? Impressive plants! I don’t have the patience for much gardening, but my hubby gives it a good effort every year. I hope you can grow some rhubarb. It’s highly resilient, so I’d be surprised if you DON’T get it to grow. And no bug nibbles on the lettuces, I am envious. Lovely looking garden, mine is predisposed to bugs and weeds…sigh! If found one caterpillar chewing on one of my cabbages. He was quickly despatched to caterpillar heaven! Oh how wonderful to see the fruits of your labour – literally!. I am amazed at how well your garden is doing in the ‘winter’ There have been a few morning frosts but your seedlings seem to have coped. And no signs of snails!!!. They must enjoy listening to you. I am renting at the moment so can’t really follow your lead so I will enjoy your garden via your monthly updates instead. Good luck with the rhubarb, it can be demanding – such as not being in too wet a soil (not a problem with the current climate). It does like to be in well fed soil. You could also try putting a plantpot over it for a while to give it more darkness. We are near the sea so lucky for us we have not had any frost this year. We have our own micro climate. Funny you say about Rhubarb and covering up. Mr P burnt a hole in one of my large flower pots (long story) and I kept it as I trhow nothing awy. I then watched a prgramme showing victorian rhubarb forcers. Hmmm I thought and the plant pot has a new use. Bet you can’t wait to get your won garden. 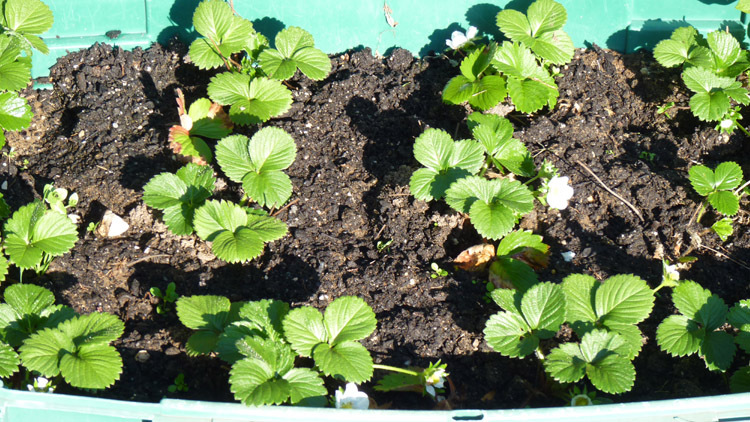 You can always grow strawberries in containers. thanks for the tip re fed for the rhubarb. I better see to that! Seems strange sitting here in the UK hearing you talking about veg growing like crazy in December and January. Here nothing much grows here in the winter apart from broad beans, sprouts and broccoli. Keep an eye on the physalis – we had them in our garden in Portugal and they spread everywhere if you turn your back on them for a couple of weeks. Productive though! I was surprised as I’ve NEVER grown veg anywhere in the winter before. I remeber your tip about the Physalis and keep it in pots. Lovely fruits! Good luck and i hope they all do well. Thanks for sharing the before and after pics – it’s amazing to see that growth, and your efforts are not in vain! Keep trying with the rhubarb (I’m a Capricorn too); never give up! Gardening is one of my passions too. Vegetable gardening is a lot of work, but it’s all worth it when you can serve fresh food straight from the ground! Good on ya PiP! I think you either love gardening or you don’t and it is addictive! PiP, I am so happy you are having such success with your winter garden. We are enjoying a bountiful winter garden as well. We are also looking for informtion on growing leeks. have you checked out hortophiles blog. she is a mine of information on gardeng? She has just posted above we need to water them well! You’re reaping the fruits of your labor–literally! It sure looks tasty. And Happy (recent or very soon) Birthday, PiP!! What fun to see your progress. I am impressed with your green thumb and envious of those monster strawberries and that lovely salad. Enjoy! Looks beautiful PIP!!! I am so jealous that you can grow stuff in winter, I am having yard and garden withdrawals…bring on spring!!! I am very impressed PIP. Wendy planted some rocket in a pot on the verandah…that stuff grows like a weed(maybe it is a weed)..before I got around to picking a bit it had gone to seed. I can barely keep my house plants alive. Kudos on the great garden! coincidentally, i found your blog and this neighborhood restaurant in the same day.. My home garden started as a concrete slab and became a rose garden. I no longer garden. Moved to a condo. But the new owner seems to be keeping it up. Good for you, PiP…looks like it will be a bumper crop! I anxiously await further photos of the growing fruits and veggies. How lovely! Hi Piglet Just started a vegetable garden In December, mostly trial and error. Beans peas no sign yet, lettuce, broccoli, strawberries doing quite well. No seeds planted in egg boxes showing yet, but live in hope. 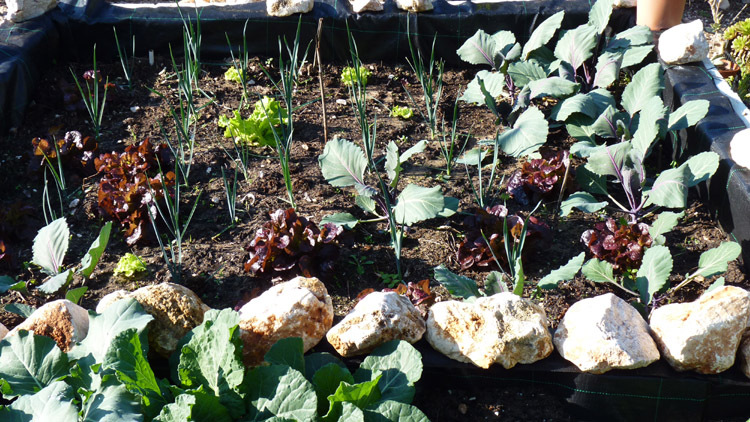 Hi trying gardener – good luck with the vegetable growing 🙂 Looking back at my vegetable patch then and comparing now I feel rather frustrated. You’ve inspired me to try and revive my strawberry plants which have drowned in the rain. Good luck with your veg and please keep me informed of your progress. Where abouts in Portugal are you? All I can say is wow …super impressive!